Prime Minister Justin Trudeau speaks at a meeting with his Liberal caucus on Parliament Hill in Ottawa on Sunday, Jan. 20, 2019. Even before he started portraying Stephen Harper as a ghost still haunting Conservative spirits, Justin Trudeau was starting to sound a bit like the former prime minister himself. 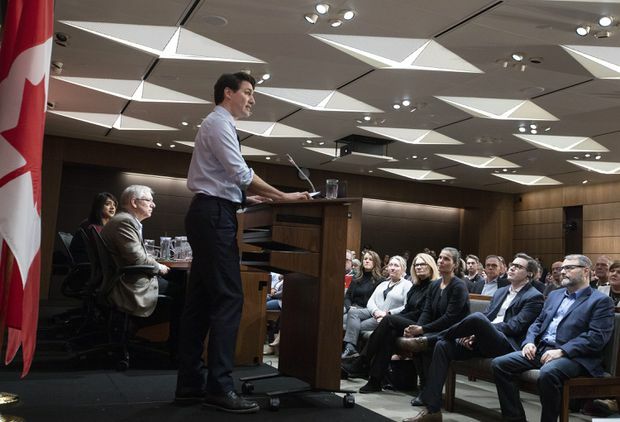 Mr. Trudeau’s brief speech to his Liberal caucus on Sunday could be counted as a kind of rhetorical keynote to an election year, and the themes should be familiar to those who can hark all the way back to the 2015 election. To wit: The world is a scary place and that opposition leader isn’t serious enough to handle it. That was high on the list of Mr. Harper’s greatest hits when he was the incumbent prime minister and Mr. Trudeau was a young third-party leader with no experience in government. The world economy was uncertain, and terrorists were threatening at home and abroad, Mr. Harper warned – while his Conservatives relentlessly painted Mr. Trudeau as an empty suit under a good haircut. Some of that is Politics 101. Incumbents usually run for a second term in words that amount to “stay the course,” while challengers tell the public it’s “time for a change.” Mr. Trudeau is PM now, and Mr. Scheer is the inexperienced outsider. Mr. Scheer, it’s true, doesn’t have a detailed platform, but neither did Mr. Trudeau’s Liberals in January, 2015. But Mr. Scheer has to keep in mind the other thing that is going on here: Mr. Trudeau’s Liberals are trying to do to him what the Conservatives almost did to Mr. Trudeau in 2015. They’re out to define him. That was hard to do to Mr. Trudeau. He had a famous father and a glamorous image. A lot of Canadians felt as if they knew him. Yet Mr. Trudeau’s Liberals still stumbled in mid-2015, as Canadians questioned his substance – and the Liberals felt the need to tease a few policy ideas before the election campaign. It might not be as hard to define Mr. Scheer. He hasn’t done it himself. On Sunday, Mr. Trudeau set out to charge not only that Mr. Scheer has “no plan,” but that his Conservatives have no heart (more or less). In 2015, Mr. Harper’s Conservatives suggested Mr. Trudeau couldn’t be trusted with the reins of government because he was incompetent, but Mr. Trudeau portrayed Mr. Scheer as scary because he is uncaring. He accused Mr. Scheer, for example, of being against a stronger Canada Pension Plan, which he suggested is something of a sin against the middle class. Mr. Scheer’s problem is that he’s giving the Liberals a canvas to paint on. It isn’t that he doesn’t have a plan, it’s that he hasn’t given a strong impression of what kind of thing he’d do. He’s got a crime policy, but mostly, he’s stuck to opposing. Most are generic Conservative talking points, but they’re not exactly a taste of Andrew Scheer’s approach. It makes sense if the idea is to get the base to cheer Mr. Scheer’s name, but the truth is they’re more likely to cheer the names of Ontario Premier Doug Ford or Alberta United Conservative Leader Jason Kenney. In Quebec, Mr. Scheer’s policy seems to be to promise anything Premier François Legault wants, no questions asked: On Friday, the Conservative Leader promised to give Quebec more control over immigration, to allow the province to collect federal income taxes of Quebeckers, among other things, though the details and the costs are still unknown. But what’s Mr. Scheer all about? The Conservative Leader doesn’t really have to spell out his platform before the election campaign, but he’d better start working on describing his own political personality. Or the Liberals will do it for him.